Everything changes the night Radyn's family is slaughtered. Driven by vengeance, he abandons his life in the traveling carnival and sets out to find the mysterious assassins, unaware they seek his death above all others. Radyn's life has been decreed forfeit by a forgotten god. But why does one god want him dead, while another seeks to make him their champion? Now, reality doesn't seem to be working. Time has started to skip. Gravity is rebelling. The Hollow World is awakening, and Radyn is walking in the steps of an ancient prophecy. The Saelydion, the primordial barrier to the underworld, is failing. The theed, no longer just a tale to frighten children, walk the surface once more, and hordes of voiceless holy men gather in the Rolwood Forest, harbingers of their masters' release. Only the Alakyte stand in opposition, an order of mystical warriors on the verge of extinction. 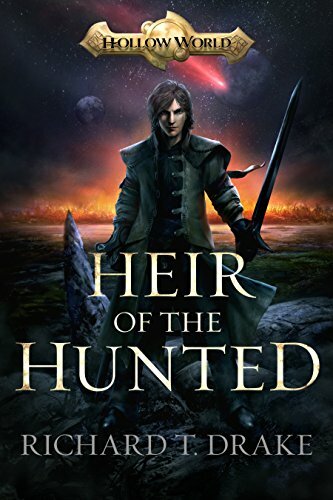 If Radyn is to avenge his family and unravel the secrets of his destiny, he must call on two unlikely strangers: Kyna, a deadly Alakyte warrior on her very first mission, and Loken the Half-Mortal, a surly demigod cast out by his father. Only together do they stand a chance at turning back the darkness... If discovering the ancient truth about their homeworld doesn't destroy them first.